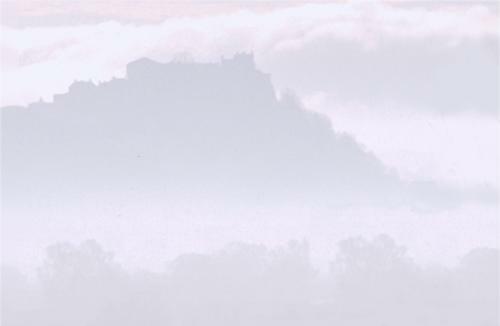 Only 20 minutes from Lenymede Bed and Breakfast, Stirling is situated strategically at the junction of the rivers Forth and Teith, standing guard over the Gateway to the Scottish Highlands. Stirling has a rich history, much of which can be seen in the many historic sites and buildings in and around the town. Only 15 miles from Callander with a regular bus service, it is an attractive town for the visitor with its historic monuments, open top-bus tours, museum, excellent shopping and many pleasurable and friendly places to eat and drink. The active visitor can take a self guided walk around Stirling using a audio tape from STAGS. This is excellent value and introduces you to places of special historic interest around Stirling. Highly recommended. Try to stroll up to the Castle via the Back Walk, a footpath following the old town walls near the foot of which is a grand statue of Rob Roy Macgregor. Try also to visit the Beheading Stone on Gowan Hill, site of numerous executions including that of Murdoch, the Duke of Albany and former Regent of Scotland. To the north-east of Stirling are the Ochil Hills with their mill towns, to the west on the southern boundary of the Forth valley, the Gargunnock Hills and the Campsie Fells, and on the northern boundary The Trossachs, famed as the territory of Rob Roy. Places of Interest around Stirling. Now completely renovated and furnished in the style of its period this is a wonderful site to visit. This 17th century building, which grew by stages over a period of some 140 years is a wonderful example of a Renaissance mansion. The earlier construction was in fact carried out by William Alexander, but was later owned by the 9th Earl of Argyll who extensively extended the building. The beautifully restored rooms make this the place to visit for history buffs and are backed up by excellent 3D computer visualisations. Commemorating King Robert the Bruce's victory over the English at the Battle of Bannockburn on June 24, 1314 this Centre is well worth a visit. At the battle 40,000 troops lead by Robert Bruce, King of Scotland, intercepted a force of 60,000 English forces who were on their way to relieve the garrison at Stirling Castle. In the ensuing battle the English lost 10,00 men and the victory is believed by many to have lead to the eventual independence of Scotland. There are excellent displays and an audio-visual presentation. A short walk from the centre's building is the flag pole and Rotunda marking the battle site, and nearby a rather magnificent statue of the King on horseback. Close by the Wallace Monument is the site of an Augustinian settlement established in 1147 by King David situated in a loop of the River Forth just outside Stirling. The 1300 AD campanile (restored) still stands. James III and his Queen are buried in the grounds. Stirling's principal church for nigh on 500 years, parts of the nave and tower still date back to the late fifteenth century. The nave roof is the finest medieval timber roof in Scotland. King James the Sixth was crowned in this very building in 1567. A stroll round the Valley Cemetery will reward with many interesting features including the Ladies Rock and Star Pyramid as well as excellent views. The ruins at the top of broad street are the remains of the Earl of Mar, palace. In the early 1570's the Earl was one of the wealthiest and most powerful men, hence the dominate position of his dwelling. This late 15th Century bridge is the site of what used to be the lowest crossing point of the River Forth and it is here that Sir William Wallace defeated the English army in 1298. Built in 1846, this Victorian jail replaced the Tolbooth Prison under the pressure of a more enlightened society. This did not mean that life was easy, but compared to the Tolbooth it was heaven. tour the jail either take a guided tour with the resident actor who will 'introduce' you to many of the historic figures associated with the jail or take an audio tape self guided tour. Looking down from the Jail tower you can see the King's Knot, formerly the site of gardens built for the visit of Charles 1st, and in the distance you can see Ben Lomond. Looking in the other direction over Stirling Town, you can see Stirling Bridge, the Wallace Monument, and the Ochils. On leaving, cross to Broad Street, passing the Tolbooth that at one time was the site of the court and the original jail, and view the Mercat Cross surmounted by a unicorn. This was once the heart of the medieval mercantile town. Turn back up the street towards the castle and visit Mar's Wark and Argyll's Lodgings. This Tourist Information Centre at the Castle Esplanade presents the story of Royal Stirling from the Wars of Independence, through medieval times to the present day. Admission free. Whilst Stirling itself lay at such an important strategic point, being located at the first bridged crossing point of the Forth, the volcanic outcropping provided an excellent site for fortification and the earliest known works date back to the 11th century. The site was militarily important during the 13th and 14th century Wars of Independence and later became a favourite residence of many Stuart monarchs. Much of the castle seen today, including the Royal Palace mid 16th century, Chapel Royal,and early 16th century, and the Great Hall is renaissance architecture, with strong French influence. The beautiful hammer beam roof was removed by one of the resident army garrisons, but is currently being restored so access may be restricted. Offering many displays, wonderful views from the battlements including Ben Lomond in the distance and the King's Knot, a raised grassy mound below the battlements that was once a magnificent formal garden. The castle also houses the excellent Regimental Museum of the Argyll and Sutherland Highlanders. This is a superb place to visit, though at the other end of the scale, the smaller Doune Castle is also fascinating and should not be missed. Many significant episodes in Scottish history took place here including the crowning of Mary, Queen of Scots in 1543. Situated below Stirling Castle, this museum was founded by Stuart Smith in 1874. It has a fine collection of Scottish paintings and also has one of the most important, and least known, Scottish history collections. This includes the oldest dated curling stone (1511), the Stirling Jug (1457) which was the 'Standard Measure' against which all other Scottish measures were regulated, ancient tartans, and a figure of Justice so old that it does not have the traditional blindfold. Well worth a visit. Admission free. Standing upon the Abbey Craig, just north of Stirling, The Wallace Monument towers 220 feet over the Forth Valley. The Monument commemorates the Battle of Stirling Bridge, when, in 1298, Sir William Wallace (1267 - 1305) led the Scots to a magnificent victory over the English army. In 1298 Scotland was invaded by a large English force led by the English king Edward I and on July 22 of that year, Edward defeated Wallace's army in the Battle of Falkirk. In the 1850's, as a result of a tide of Nationalism, funds were raised to build the monument and work was completed in 1856. Wallace's famous two-handed broadsword is displayed here. The Monument commands magnificent views over the Forth valley, whilst the Craig offers enjoyable woodland walks. For details of opening times and tariffs for these and other attractions visit Times and Tariffs for The Trossachs, Stirling, and Edinburgh Page.